On December 1, a traditional performing art for the dedication of the Tanadui Festival, which has been designated as an important intangible cultural property by the Japanese government, commenced at Yomochi-utaki on Taketomi Island. The island was crowded with many visitors from near and far who had come to see the traditional performing arts that dates back more than 600 years. The performances will be held until December 2, featuring about 70 dances and kyogen plays. Because the lunar Bon Festival conflicts with Shichi (a festival on Iriomote Island) this year the event was held in December for the first time in 80 years. The Tanadui Festival is held to pray that seeds that have been sown grow successfully. 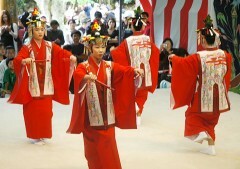 The traditional performing arts are the most exciting event of the 10-day festival. On the first day, the various performances continued from 9:30am through to the evening.